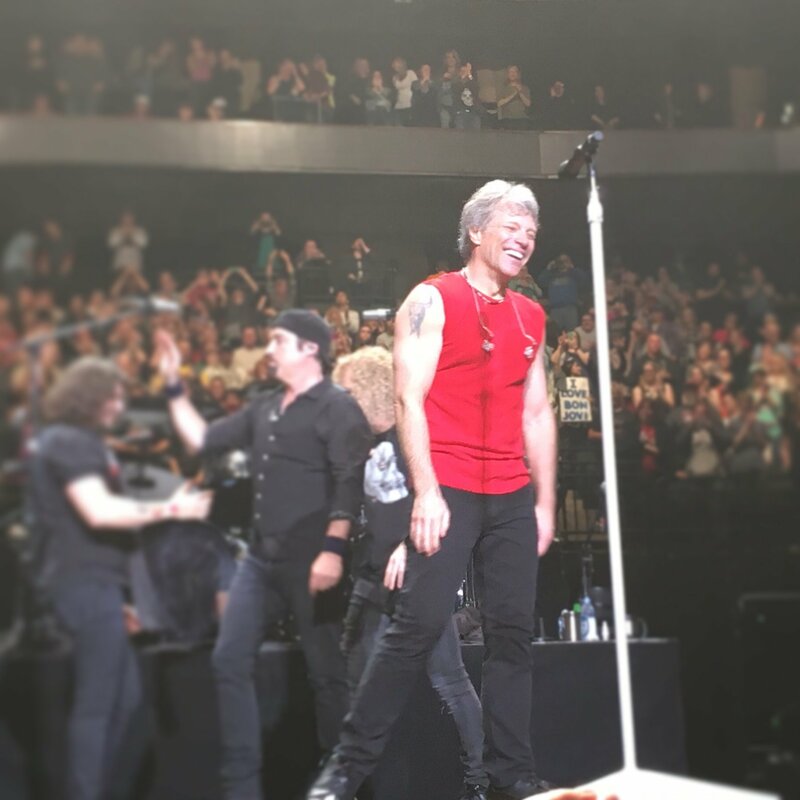 Once upon a time, I was an aspiring songwriter and my idol (and giant crush) was this stellar human being, Jon Bon Jovi. I knew every word of every song he ever wrote, performed or produced. I was inspired by his talent, his showmanship, his big heart and his insistence that anyone could get through anything with a little help and faith. He was (and is) also super adorable, ahem! Twenty four years ago, my mom sent my demo tape to a local radio station, and they got me backstage to meet Jon and tell him how much he and his work meant to me. But I got tongue tied, and handed him a letter with what I wanted to say. I still get goosebumps just looking at the picture, remembering that moment. He encouraged me to smile. 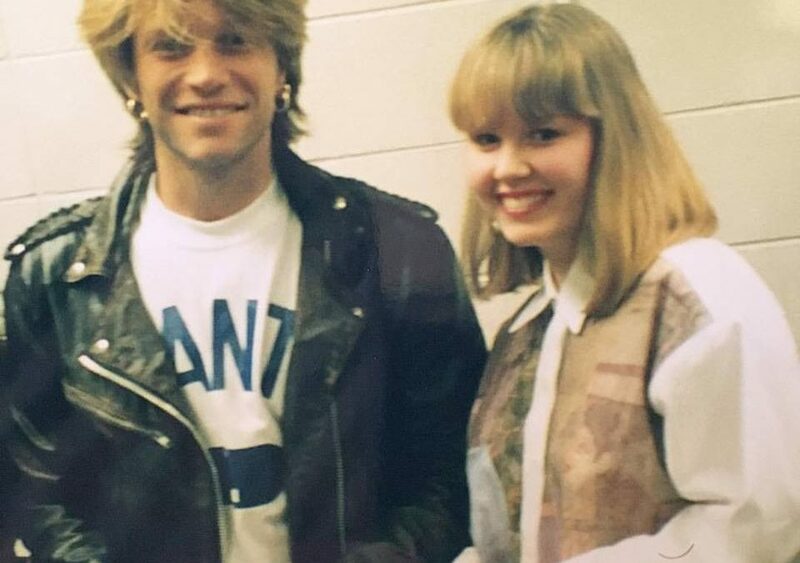 He put his arm around me and made me feel like I wasn’t the millionth girl to pose backstage with him (though I was likely the ONLY one to ever attend a Bon Jovi concert in a button down shirt, LOL!). He was a rock star in every way. Tonight, a new dream is coming true. From the time I was 13, I’ve never missed a chance to see the band when they’ve come to Minneapolis and every show has been amazing. I always leave feeling like I’m floating on air…even though I’ve always settled for seats that weren’t too expensive, far from the stage, immersed in the crowd. But tonight? Tonight I get be right up close again, but in a new way. The planets aligned and I get to revel in the show sitting (err, dancing and singing and screaming!) from third row center. THIRD ROW, people!!!! And with my happiness manager Jill and her equally-excited family alongside me! This only materialized in the last week and it’s probably good I haven’t had time to really think about it or I might have hyperventilated by now. Oh, you guys. I’m so excited, my heart is racing. 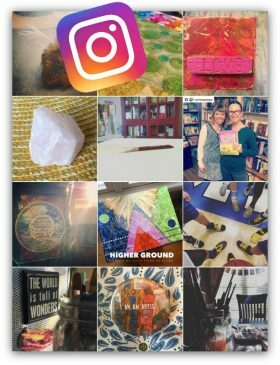 This is what life is about — these moments of joy, the honoring of what makes us come alive. We all deserve to do the things that make us feel like kids again, to do what makes our hearts sing. What is that for you? I’ll be thinking of you and all of your dreams as I’m rocking out tonight.